The Assynt area offers some of the most spectacular scenery in the Northern Highlands, and countless lochs holding wild brown trout. There are also two spate rivers, the Inver and Kirkaig, running west to the sea that allow the passage of salmon and sea-trout into some of these lochs. 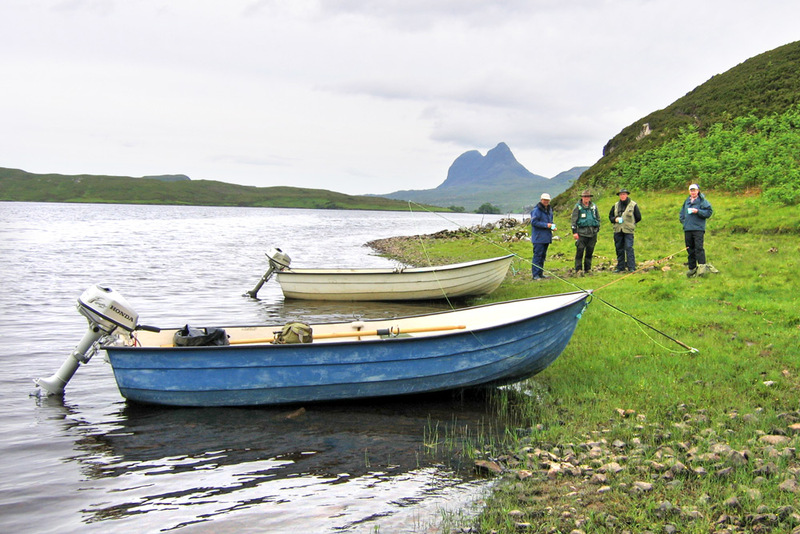 Most of the brown trout fishing in Assynt north of Elphin is controlled by two organisations: the Assynt Crofters' Trust and the Assynt Angling Group. The Assynt Crofters’ Trust controls about 200 lochs north of Lochinver. 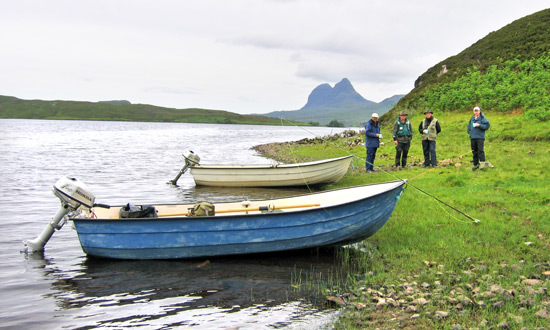 Most of the fishing to the south is controlled by the Assynt Angling Group, a partnership between the local angling club and a number of estates. This is a large area comprising over 150 lochs, some much larger such as Assynt, Veyatie and Cam, and is divided into 3 fishing zones (West, East & South). 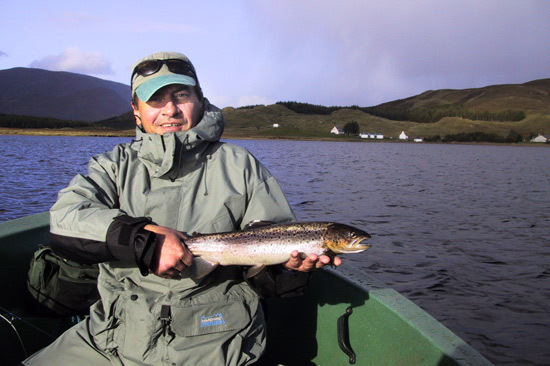 The fishing in the Assynt area is generally characterised by large catches of very hard-fighting small trout, typically weighing 2 or 3 to the pound, but on most lochs there are also reasonable stocks of better fish around the pound mark, with a few fish of 4+ lbs caught each season. 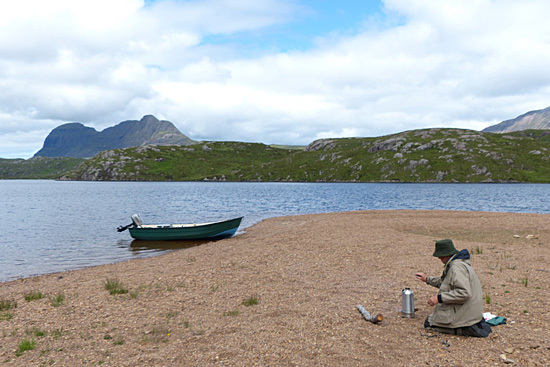 A number of lochs also have Arctic char and ferox brown trout. The Inchnadamph area is famous geologically for outcrops of the Durness Limestone and many lochs have limestone spring sources. 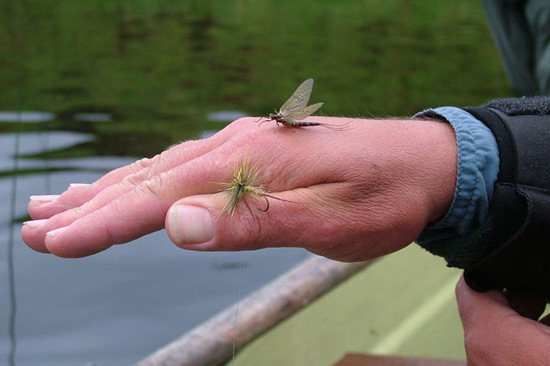 A consequence of this is that a number of lochs enjoy a mayfly hatch in June and early July, and this can provide some excellent sport. Veyatie lies at an altitude of 381 ft (116m) and is 4 miles (6.5 km) long, running north-west to south-east. 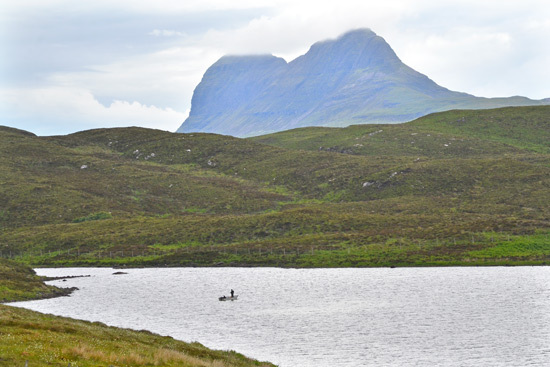 It is generally only 200-500m in width with steep sides, dominated by the peaks of Suilven to the north-west and Cul Mor to the south-west – a spectacular place to fish. 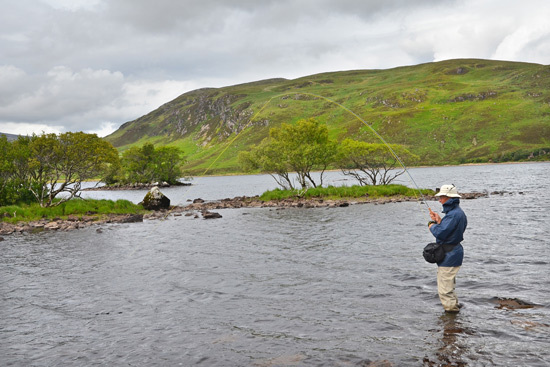 The centre-line of the loch is deep at 20-30m, and the most productive fishing is along the shore lines and in the shallow bays. Brownies of ½ to ¾ lb are the norm, but there are larger fish and the loch is also renowned for ferox. Great sport can be had during the mayfly hatch with patterns such as French partridge wets and Grey Wulffs. ‘Cama’ is another large loch with an area of 256 Ha (633 acres) and a length of 3.3 miles (5.4 km). It lies at an elevation of 407 ft (124m), and reaches depths of over 30m towards the north-west end. 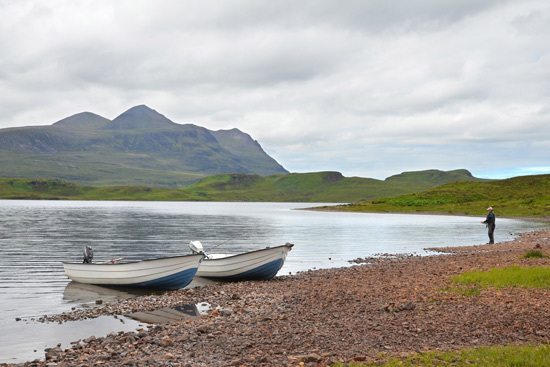 The south end of the loch, conveniently closest to the moorings at the cemetery, is generally shallow however offering great drifts, particularly around the islands, and is often sheltered when the far end of the loch can be unfishable. 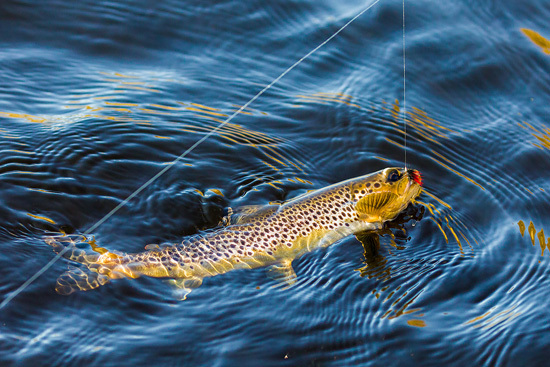 Trout generally average ½ lb, and char are also caught frequently. Urigill lies at the top of the chain of Urigill-Cam-Veyatie at an elevation of 515 ft (157m). 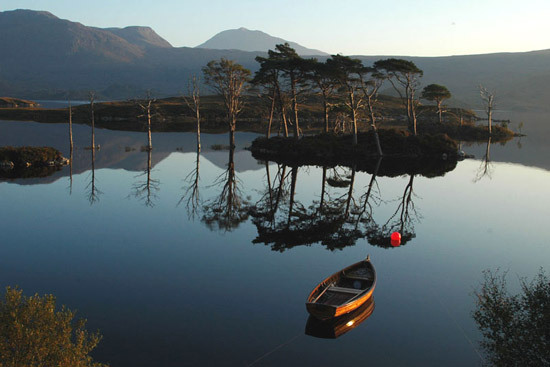 It is a sizeable loch of 196 Ha (483 acres), with a length of 1.8 miles (2.9 km) north-west to south-east. It is a shallow loch, rarely exceeding 5m in depth. The best fishing is at the south-east end near the inlet burns and around the islands. Expect large ‘baskets’ of trout of 2 or 3 to the pound, but there are some much bigger fish in the loch also. Borrolan is a roadside loch lying at an elevation of 466 ft (142m), that also drains into Loch Cam via the Ledmore River. 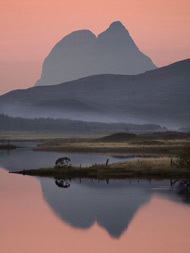 It is a shallow loch full of obliging trout, typically 2 or 3 to the pound, and can be fished from the bank as well as by boat (sunset photo above). A loch of 1 mile (1.6km) in length lying at an elevation of 500 ft (154m). Loch Awe has a surface area of 32 Ha (80 acres) and is generally shallow, with a number of islands making it very scenic. Large numbers of ½ lb + trout, and a few larger ones. Salmon also enter the loch. 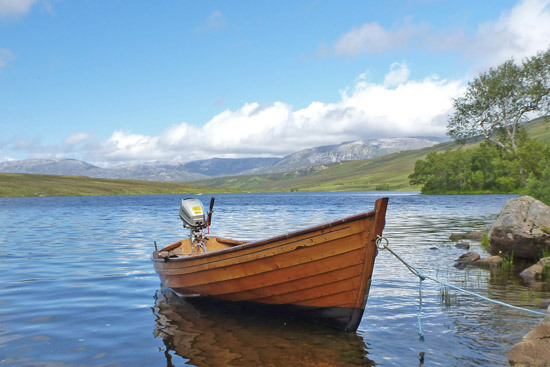 Follow TroutQuest's board showcasing trout fishing in Assynt and Sutherland's west coast.